Daily Illuminator: Munchkin Promo And Bookmark Sale On Warehouse 23! May 18, 2018: Munchkin Promo And Bookmark Sale On Warehouse 23! One of the strengths of the Munchkin line has been the variety of promo cards and bookmarks we've offered over the years. A couple of years back, we started selling some of them on Warehouse 23. 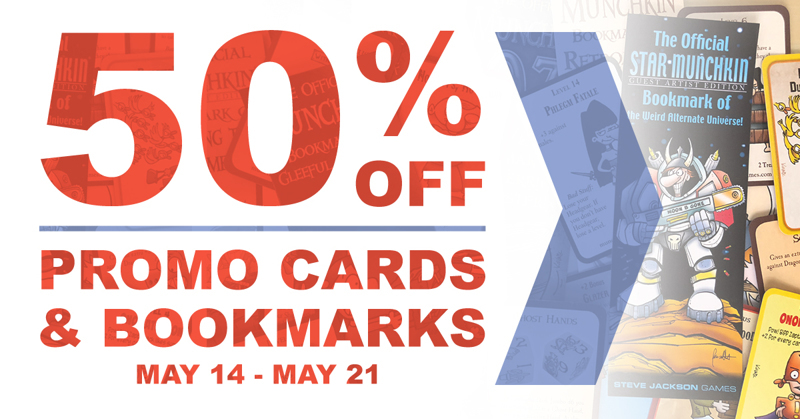 To celebrate the variety of promo swag you can get there, we've cut the price of our Munchkin promos in half, now through Monday, May 21. That means every card and bookmark costs 25 cents! You can't even make a phone call from a pay phone for a quarter anymore . . . assuming you can even find a pay phone. Click here to check out our sale!